HELP THE ENVIRONMENT AND NEVER WASTE MONEY ON TRASH BAGS AGAIN. RE-USE YOUR FREE CHECK-OUT BAGS! ​Never clean odor filled, grimy trash cans again! 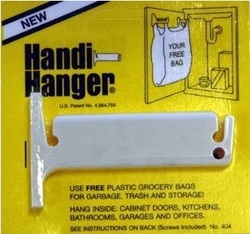 The Original Handi Hanger is a money saving device that is a plastic bag holder. It was specifically designed for use with self-handle plastic bags which are commonly used in grocery and convenience stores. It is an Earth friendly product that offers you a way to re-use your FREE plastic bags. 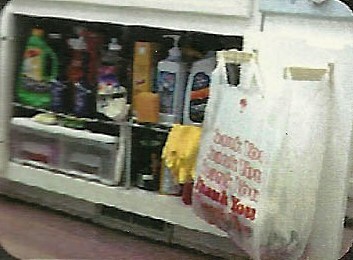 Its unique design enables you to quickly and easily slip the plastic bag's handles onto the hanger so the bag will hang fully secured in the open position. 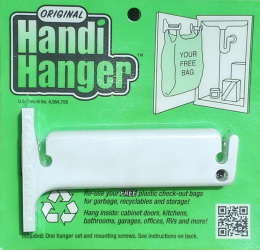 The Original Handi Hanger is an ideal place to keep trash, recyclables, towels, sponges, rags, or any other odds and ends stowed away out of sight yet within easy and convenient reach. It can be easily mounted inside kitchen or bathroom cabinet doors or virtually any wall surface in your home, office, garage, RV, dorm room or anyplace you see fit. The Original Handi Hanger comes packed with one set of our specially shaped plastic hangers which mount with accompanying screws. We are updating our packaging.